In a language with indefinite and definite articles, have an article that is historically related to the interrogative pronoun/determiner 'what'. Unlike 'what', however, it signifies that a definite noun is the topic of a yes/no-question. In the pseudo-English used to illustrate this, I'll form it analogously to a/an: wha, whan. have you heard whan opera? the emissary gave wha gift to the king? the emissary gave a gift to wha king? wha emissary gave a gift to the king? (or quirks analogous to that). Consider a system with several noun classes, and a complicated system of moods, aspects, aktionsarts and tenses. Now, different noun classes – both as subjects and objects – force different conflations of the actual available TAMs. Thus, baud ŋe edə vena - I had a farm (farm was by me). The preposition edə occurs in some temporal expressions and some fossilized locative expressions, but is otherwise not used much. In a few dialects, the complement can also be an infinitive, in which case it's a causative structure, or an active(!) participle, in which case it's a passive. This image should be fairly self-explanatory: the circle expresses insides of things, the upper half circle represents the outside of a convex surface (hill, convex structure, etc), the lower half circle express the outside of a concave surface. 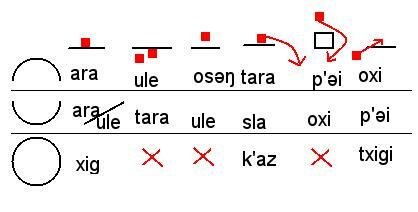 'ule', with regards to a convex surface expresses 'under, beneath', etc. It's worth noting that the surface of the sea also patterns with the concave surfaces. This is not an exhaustive description of Sargaĺk spatial postpositions, nor does it fully exhaust the spatial usages of the ones presented. Most conlangers I know seem to be mainly interested in morphology, and may even go so far as meeting formal syntax theories with suspicion. Moreover, I have never had a proper introduction to syntax myself either, for instance, in class at university. However, since Ayeri is rather different from German or English, I have long had an itch to figure its syntax out in a more structured way, in order to find out and describe in standard terms what I have been doing so far without giving it too much of a second thought. Since I’ve been trying to keep up a certain level of seriousness in the grammar, simply stating that Ayeri is VSO and heads mostly go first, and treating everything within 5 pages won’t do. Dealing with such a complex topic this superficially does not seem satisfying to my own curiosity and ambition. I am hoping that finding out more about Ayeri’s syntax would uncover more remaining blank spots, the filling of which would allow me to add yet more depth. Yet, I am impatient to keep on writing, since I really don’t want to let the grammar drift off into negligence again this time. I had written some 20 pages on syntax earlier this month, however I realized that much of what I had written is probably wrong, since, for example, I disregarded lexical integrity as a fundamental principle with regards to what I assume to be clitics, simply for the reason of not being aware of this principle for the lack of formal training in a very formal discipline. For the time being, I have deleted what I wrote about the phrase structures of DPs/NPs and AdjP/AdvPs from the PDF in the main development branch on Github (‘master’) to not spread misinformation. Once I know more and have reevaluated some things, development on this part will go on in the ‘trunk’ branch, which I will merge back into ‘master’ once I am confident enough that my analyses are at least not completely off. This set of ideas were inspired by discussions with the author of Ayeri. Let's have a look at deictic marking in the verb complex. We can consider some obvious things - deictic marking can sort of be dependent on person – one could have here unmarked on first person verbs, there unmarked on third person verbs, and maybe put second person in a situation where here is unmarked in the present, but there is unmarked in the past. Certain third person NPs could of course doubly inverse this: the demonstrative 'this' itself, as well as a third person listener pronoun. Now, with verbs of movement, there may be two slots, although both are not necessarily filled. If both are empty in a verb meaning 'depart', a first person subject in the present would be parsed as 'I am leaving (from here to there)'. Here and there are obviously distinguished, but movements can also happen between two distinct theres, or even from or to an indefinite place - which have their own morphemes, cognate to indefinite pronouns. For verbs of movement, the deictic markers also become more complicated, interacting with aspect in various ways. Perfective movements towards will by default be oriented herewards, so direction towards there is marked by a distinct morpheme, movement towards anywhere is marked by the same indefinite morpheme previously mentioned. Perfective verbs of departure will by default be parsed the opposite way to the table given above, and likewise perfectie verbs of movement along. Imperfective verbs of movement depend on the person in the same way as given in the table above. The indefinite morpheme previously mentioned is also used when interrogative pronouns are used. 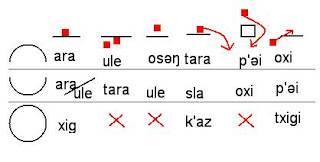 Person is quite common in conlangs, but we can even almost find other person-like structures in human languages - some Asian pronoun systems rather may be ranked by social stature than by speaker > listener > other. We could imagine some other system, though - the simplest being some way of adjusting how social stature is determined (age, with gender as tie-breaker? gender, with age as tie-breaker? some other type of social structure than any known human structure); maybe to some not entirely 'ordered' type of ranking (so it's more of a social network than a social hierarchy). Suggestion: come up with a different system than person, and post in a comment. Let us consider a language different anaphora depending on whether the NP it refers to is definite/specific or indefinite.The definite anaphora are the baseline - the pronoun for the masculine definite noun we call the masculine pronoun, the pronoun for the feminine definite noun we call the feminine pronoun, etc. If any people arrive, he(=they) must wait here. Iif any man arrives, she(=he) may wait here. If my boss arrives, he(=he) must wait here. You are currently browsing the Conlangers blog archives for January, 2017.